For know-it-all New Yorkers and lovers of NYC! Mark your calendars: it’s nearly time for the Panorama Challenge! Once again, The City Reliquary, Queens Museum, & The Levys’ Unique New York! have partnered for an exciting evening of trivia with the whole city at your feet. 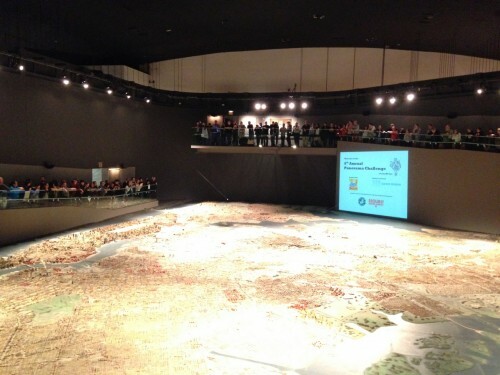 Meet us at the world’s largest architectural scale model – The Panorama of the City of New York at the Queens Museum! Panorama Challenge quizzes players on all things NYC. MC Gary Dennis reads questions while our judges highlight clues on the Panorama using lasers (well, laser pointers). Players in teams of 10 (or so) use those clues (and musical hints!) to determine the correct answer. Quizmaster Jonathan Turer returns for his eighth year with another batch of new questions. Sandwiches, snacks, and beverages available for purchase, with beer from our friends at the Brooklyn Brewery. Proceeds from admission and concessions support The City Reliquary Museum and Queens Museum. A free shuttle will travel between the Mets‐Willets Point 7 train stop (pick up: Roosevelt Ave, below station) and Queens Museum from 5:30-7 pm and 9-10 pm.